Why does 3D printing get all the love? Probably because it evokes visions of Star Trek’s famous replicator. Back here in the humble 21st century, however, it’s just one of the computerized manufacturing methods set to upend industry. Another method, subtractive manufacturing, is the yin to 3D printing’s yang. While additive manufacturing (or 3D printing) builds parts layer by layer from the ground up, subtractive machines (like 5-axis mills) whittle precision parts out of solid chunks of metal. Computerized milling machines smooth and perfect industrial parts. And you need both. Currently, even the best industrial 3D printers don’t have high resolution. You can see the layers sitting on top of each other, lending items a blocky, unfinished appearance. It’s a little like they’re graphics in an early Atari game (or maybe the original Nintendo). Left unfinished, 3D printed parts aren’t generally precise enough to be used. So, how do we take them from Atari and Nintendo to Avatar or better? Smooth them down on a computerized mill and trim excess material. Together, 3D printing and computerized milling enable the production of precise parts impossible to make any other way. Instead of requiring assembly, such parts can be printed and carved as a single, unified whole. Designers can experiment with weird new shapes. And now, the two have been combined in one machine by German/Japanese firm, DMG Mori Seiki. Released last year, DMG Mori’s Lasertec 65 3D, uses two interchangeable heads to print then perfect metal parts. The first head makes 3D shapes by shooting metal dust onto a print surface and liquifying it with a laser. 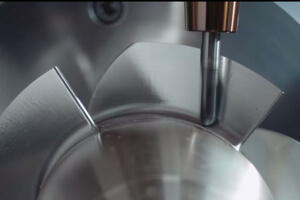 The machine then switches midstream to a 5-axis mill bit to smooth and perfect the part. The company says their metal 3D printing method is significantly faster than competing methods. And by working mid-process, the machine can mill sections that are not reachable once the part is finished. In short, the machine combines the flexibility of 3D printing with the precision of a milling machine to allow “additive manufacturing in milling quality.” But never mind the marketing for a moment. There’s just something mesmerizing about watching this machine work. It’s like a robot sculpting metal pottery.